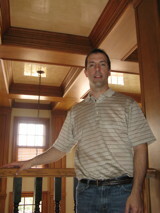 Chuck Bick is a dedicated craftsman with over 20 years experience customizing interior finishes. He was apprentice to Dave Lang, Master Faux Finisher, in Rochester, NY in the early 1990's and founded "The Interior Touch" in the Dallas area in 1997. Chuck enjoys collaborating with his clients to achieve their vision and his reputation is one of impeccable quality and integrity. As a Professional Working Artist, Chuck continues to expand his skills to offer more extensive palettes of wall and cabinet finishes to his clients. In 2004, Chuck became a Certified Applicator of the Plasters of Italy. He loves the media and the depth and breadth of finishes that can be created through it. Chuck continued to hone his Fine Art skills with classes at the Rocky Mountain College of Art and Design in 2005 and attends various Faux Finishing Seminars, Vendor Workshops and stays abreast of new techniques as the line of Italian Plasters and the industry evolves.